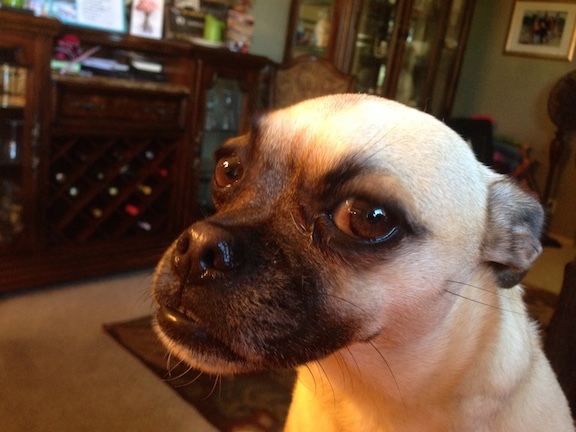 Chloee is a three year old Pug Chihuahua mix in Rancho Palos Verdes, California. Her owner called me in to help the dog learn to not get so excited all the time. I sat down with the family to discuss Chloee’s behavior and what they wanted to accomplish in the session. I always try to get a feel for the dog’s day to day life, what does it consist of in terms of; exercise, structure, rules, boundaries, limits, etc. I discovered that Chloee had pretty much “free reign” of the house and didn’t really have any rules to follow. Combined that with Chloee’s being showered with attention and affection, its not surprising that she had lost her balance. She had won the doggie version of the lottery; she could do anything she wanted and there were no consequences. This lack of structure is almost certainly why the dog acts in a pseudo-aggressive way when people knock on the door. In her mind, the house and humans are under her authority because this is how the majority of the humans in the house treated her. If someone let you do anything you wanted, you can get out of balance pretty easily. The headlines are filled with lottery winners who’s life takes a nose dive after winning a huge sum of money. Making matters worse, the family had gotten into a habit of picking the dog up and trying to pet her to calm down when she got overexcited or showed aggression when guests arrived. Picking up a dog in this situation usually intensifies things. Because the dog can’t run around, it feels held back and puts more effort and energy into their alert. Not everyone in the home acted this way. One Grandmother lives with the family and I learned that she used a rolled up paper to swat the dog and also rubbed her nose in any accidents. These techniques have been proven ineffective and also detrimental to the dog. If you know of anyone who thinks punitive punishment (spanking, swatting, striking a dog) or rubbing his nose in urine, please educate them that there techniques usually have the opposite effect than the person’s attention and should never be used. I also offered a few suggestions to the family’s mother about how she interacted with the dog. She had gotten into the habit of using a very high pitched, fast paced baby talk voice when speaking with the dog. Each time she did so, you could see an immediate and pretty dramatic impact on Chloee’s energy. She started to dart around, breath faster and jump up each time the mother spoke to her this way. The mother wasn’t particularly happy when I first pointed this out as she clearly loves her dog and likes to express her love this way. But this vocal delivery is a big influence on the dog’s over excited energy and by extension, behavior. By simply speaking to the dog in a calm voice and manner, she will be in the best position to positively influence and change the dog’s habit of engaging in various unwanted behaviors. The father of the family was very frustrated with the dog as he often works late nights and didn’t like the dog barking like crazy at 2-3 in the morning when he got home. Chloee’s accidents, overexcited behavior and failure to constantly respond to commands or corrections certainly weren’t helping either. To help the family get this dog back into a calm and balanced state of mind, I suggested a number of rules and boundaries to help the dog start to see and identify the humans as her authority figures. Because the family has an active lifestyle, I suggested some rules that would be easy to enforce without taking much time. The first rule was to make the furniture off limits for 30 days. While getting up on the furniture itself isn’t a bad thing, it is a heightened position to dogs as they relate the height that they sit to their rank amongst the group. By blocking the dog from sitting at the same height as the humans, they can help her see herself as being in more of a follower position. This will help the dog react less and accept corrections better when engaging in unwanted actions and behaviors. Next I went over a leadership exercise and a few new ways to disagree with unwanted actions and behaviors. While conducting the exercise, I saw Chloee’s excited energy and jitteriness gradually dissipate. By the time we finished, the dog was completely calm, looking to and waiting for her family members for guidance in a respectful way. To stop the dog from over barking at the door, I had one of the kids play the part of a knocking guest so I could show the family how to claim the doorway. The first time I went through it, Chloee barked quite a bit initially. But as soon as I started to correct her, she walked away and the barking subsided substantially. By the time we finished practicing, Chloee’s barking was down 80-90%, and she stayed on the far side of the room when the members of the family claimed the door area. It usually takes 6-12 repetitions of the doorway claiming exercise before a dog starts to defer to the humans when hearing the doorbell. I suggested that the family’s children practice knocking at the door the next few times they come home to give their mother the ability to practice claiming the doorway. When we wrapped up the session, Chloee was completely spent. The leadership exercise we practiced is a mental challenge and it usually wipes out the dog. As they practice, Chloee will become sharper mentally, while her mastery of the exercise will lead to more confidence and self esteem. Combined with the rules, boundaries and structure we added during the session, Chloee’s newfound respect for their authority will continue to grow as will her responsiveness to their commands and connections.